Misfit is a young, start-up brand many of you may not have heard of up until now. Misfit is responsible for creating a new wearable health and fitness tracking gadget known as Shine. Classified as a personal fitness tracker, Misfit's Shine is the latest wireless fitness tracker to join an ever-expanding market of smart, wearable activity monitors. Unlike Jawbone's Up and Fitbit's Flex writsband trackers, the Shine is heavily fixed on being the most premium, most elegantly designed fitness tracker ever made. The Shine is the first truly unique fitness tracker that can track more physical activities in order to accurately count how much calories you've burned off during the day based on how intensive an certain type of activity is than any other fitness tracker. This is all it. Misfit's Shine is an all-aluminum machined sphere with alien-like technology embedded underneath its beautiful, flattened Mentos-like shape - or Macaron-like shape depending on how you look at it. You can tell right away that the Shine has within it Apple-esque design qualities, and that impression becomes clear when discovering that Misfit's entire existence has been influenced by Steve Jobs himself. Slightly larger than a quarter in diameter, hardware wise Shine manages an impressive 4 month long battery life, Bluetooth 4.0 wireless connectivity and a 3-axis accelerometer motion sensor that tracks your every move using Misfit's proprietary processor and software. All of that hardware is encased by a tough, water-proof aluminum enclosure rated at 5ATM - which is submersible down to 150ft (45m). 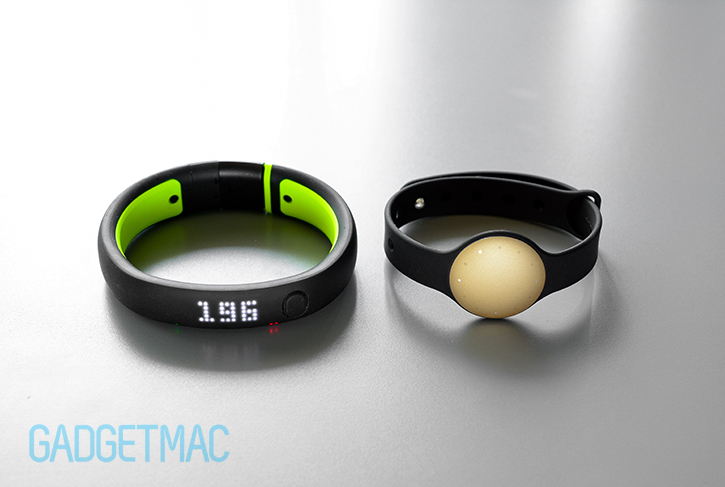 It should be said that Misfit has visually reinvented the personal physical activity monitor with the Shine. It's a highly-wearable device that can adapt to any situation in pursuance of tracking a number of physical activities whilst having the most unobtrusive modular form factor. I say "visually" because underneath its unique design, Shine is in fact another fancy pedometer that happens to track quite a few more types of activities that other trackers don't with its configured software. Shine's acid-washed, powder-blasted, anodized finished unibody aluminum build is an exquisite modern refinement we have never seen before on such a wearable fitness tracker. It most certainly looks incredible, feels extraordinary, and is remarkably solid and extremely high quality. 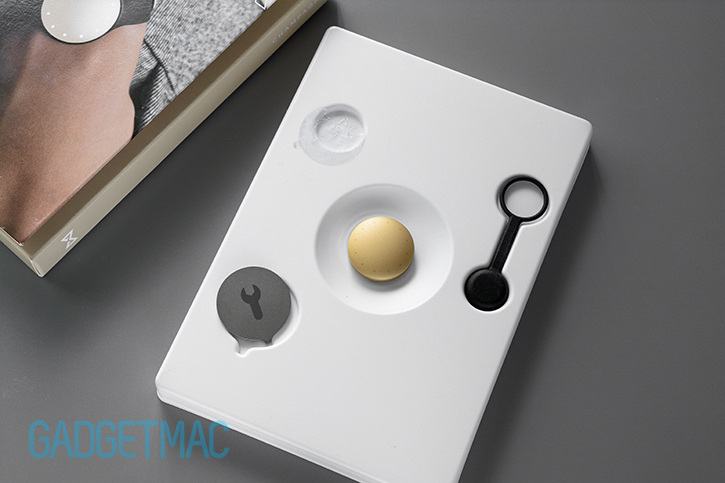 Misfit's design work will undoubtedly win it a few awards. From a build quality standpoint, Shine is seamlessly put together and feels just like an Apple product minus the iconic "Designed by Apple in California" wording you'd expect to find on the back. Now that's high praise. Durability it seems is Shine's forte. It's built to survive a tumble in a washing machine, rain, salt water, chlorine and an occasional drop. I mean look at it, it's a tiny solid piece of metal. What could possibly go wrong? In other words, it is brilliantly made, looks and feels like a piece of jewelry. That also makes you want to wear it, something that I can't quite say about Nike's FuelBand or all of Fitbit's various fitness trackers. It's not bigger than a quarter, and just as thick as 4 stacked together at its thickest point. Because its tapered spherical design slims it down so even further, it literally only feels like you're holding two quarters in comparison. And if you're not familiar with US currency, than imagine a piece of Mentos that has been sat on. Sophistication aside, the Shine wouldn't be much use without accessories that will let you wear it properly during certain types of activities. That is why Shine features a clever, ingenious new way of attaching itself onto different kinds of accessories using a groove mounting system. Shine's sport band and magnetic clasp both have a rubber gasket-like O-ring that simply stretches over like a rubber band and fits snuggly into the groove around the Shine. This forms a minimal, low-profile solution that also keeps the edges of the aluminum lightly protected against bumps as the rubber ring forms a periphery around the device when attached. So how comfortable is it to wear? I know I've said Fitbit's Flex was really comfortable to wear compared to other wristband trackers, but Shine is without a doubt the most comfortable gadget I have ever worn. It's like an aerodynamic bullet train slicing through the air as it speeds across the country. First thing you notice is how lightweight it is, and then you realized just how flat it sits against your wrist thanks to its ultra low-profile design and seamless rubber wrist strap. I really like how thin and narrow Misfit made Shine's sport band strap without being overly narrow in a string-like kind of way. Fitbit's Flex is the closest wristband tracker to match Shine's thin profile, however, it isn't as uniformly flat as the Shine. Shine is the most organically pleasing to use fitness tracker ever made. Everything about it screams high-tech in the most benign form possible. If you're a guy, wearing the Shine on your wrist will be like wearing the smallest most lightweight watch that really doesn't look anything remotely like it. Because it's thinner than any other wristband tracker, Shine is more comfortable to sleep with as there's little to no drag that will interfere with your covers. With such a smooth, tapered shape that keeps a very low-profile, you'll hardly notice it's on your wrist. The strap is of course adjustable and should fit pretty much anyone. You'll notice it's got a matching aluminum clasp which can be easily snapped into a desired hole using one hand to best fit your wrist size up to 9" (23cm) in diameter. Like a belt buckle, the strap is first put through a notch while the clasp is positioned at the very end of the strap which allows it to keep a clean and neat profile no matter what length you've set to fit your wrist leaving no loose end. Misfit's Sport Band is a great lightweight rubber wristband to workout and sleep with, but it really doesn't do the Shine any justice in matching it with premium qualities. However, you can spend $80 on a Leather Band accessory which matches Shine's phenomenal build quality in a more sophisticated manner. The cool thing about the Shine system is that Misfit created even more creative wearability options like this fancy Necklace pendant accessory you can purchase for $50. Should come in handy when you're out surfing we hear. The sport band will be subjected to lots of stretching over the course of a few months, and only time will tell if the rubbery material will hold its tightness and shape required to securely wrap around the Shine. Obviously nothing we can put to the rest at the moment, but we highly doubt both the sport band and magnetic clasp will grip as tightly as they do now with roughly two months of daily use. Fortunately spares parts are available for purchase, and in any case any failing should be covered under Misfit's warranty. Looking at Misfit's more premium leather wristband accessory, there's a definite difference in quality which would suggest that it would make for a much more solid wrist wearability for the long run other than the fact that together with the Shine it makes for a great permanent-like watch solution besides the sporty and more lightweight rubber sport band. Another way you can wear the Shine module is by using the included magnetic Clasp which opens up a wider range of wearability. With the Clasp you can attach Shine to your clothing much like Fitbit's One clip-on tracker in various places that would enable you to track more types of activities where by wearing the Shine on your wrist wouldn't have been possible. The magnetic closure is strong and will not simply detach off of your clothing without some kind of pulling force. This let's you clip it onto things like your shoe, shirt, waist, pocket and pretty much anywhere you think would track your movement in a comfortable way. As much as I like the convenience of Shine's magnetic Clasp, it isn't very reliable in securing Shine on your person. The risk of you losing your tracker is pretty high as far as I've discovered because any stretching of your clothing and body or a tug from friction against an object can easily unclip the magnetic clasp setting the device free without much force. However, the Clasp is secure enough that it won't simply detach when running or cycling. Then again it isn't surprising that no other fitness tracker utilized a magnetic clip as it can be a nuisance. In the time that I have been wearing it, the Shine fitted with the magnetic Clasp would get caught on things and will simply fall off or at other times it'll magnetize itself onto metals such as when getting real close to a car door. You should just avoid metal railings, refrigerators, metal chairs, other people wearing a Shine and generally anything that's made out of magnetically-active metal if you don't want to lose a $120-worth little gadget. When looking at the top there's not a whole lot going on, and that's purposely so. The face of the Shine is very clean, perfectly round and minimalist until you double tap its svelte aluminum dome which will immediately bring up a ring of 12 brightly lit white LED lights shaped like dots. This ring of LEDs is known as a goal meter which gradually fills up around in a circular motion notifying you of how close you are in achieving your set goal for the day. And in that way, this glorified bright LED ring helps to motivate you in closing the gap. The more you engage in a activity, the more LEDs will light up much similar to Nike's FuelBand, albeit less colorful. When a set goal is fulfilled, the ring will perform a ceremonial dance of flashing swiftly around when tapped. In order to achieve a water-proof design and seamlessly LED light integration, Shine has precision laser-drilled micro dots made on top of the aluminum surface enabling the LEDs to shine through that is completely water-proof, leaving a clean looking, seamless surface which is exactly what Apple does with its products. Shine isn't touch-sensitive, it is motion-sensitive meaning that when you tap it you actually need to apply a little force in doing so. Using two fingers is the correct way of bringing up Shine's LED goal points ring and clock face and it works flawlessly every time as long as you're wearing it. Speaking of which, Shine doubles as an elegant LED watch. But it doesn't offer a very details clock face. After you've doubled tapped the surface, Shine will first display your goal status and then it'll show you the current time which has been automatically set for you when you synced with the app. The way you read Shine's seemingly confusing clock face is by first looking at the dimly lit dots which represent a clock grid in a + formation using 12, 3, 6 and 9-o'clock reference points. The actual hour will be represented as a brightly lit LED dot while the minute is represented by a brightly lit blinking LED dot. But because of the limited space, the clock face is always displaying the approximate minute hand as it is is missing roughly 4 minutes of detail. However, much like a bell tower, Shine does in fact tell you the exact total of minutes by blinking the minute in one spot so you'll have to pay close attention and count the blinks. For example: if the time is 9:44, the LED will blink 4 times denoting the exact amount of minutes. So yes it isn't a very legible clock face, but you definitely get used to reading the time on this unique digital LED matrix. Around the back, Shine has a black "12" numeral reference point to help you correctly orient the otherwise symmetrical front side of the device. While most of Shine's aluminum body is matte in texture, flanking its groove are these polished, chamfered-like edges which reflect surrounding light and color with a mirror finish giving Shine a touch of jewelry-like style I think looks really sharp in contrast. A quick overview of what's inside the packaging - you will find a black one size fits all sport band, a black magnetic clasp, a single standard button-cell CR2032 battery and a plastic tool that you will use to open up Shine for battery installation and replacement. When it comes to install the button-cell battery into the Shine, all you need to do it push in and tilt the included plastic tool into a tiny notch right above the "12" marking in order to remove the Shine's aluminum back battery cover. But removing the back cover is easier said than done mostly because there are such tight tolerances involved, so you'll be glad you won't have to do it again for another 4 months. The plastic tool is somewhat flawed in that its small tip wears very quickly after the initial process of prying off the battery cover. Instructions are very minimal as far as documentation is involved. Other than a few basic, poorly described markings on the back of some packaging material, you'll most likely find yourself heading to Misfit's site for more details on how to get things going. Misfit put up a video guide on how to replace the battery which is helpful. With no built-in battery to charge, Shine has a very big advantage over other trackers which require charging up every few days. And when it comes to purchasing a replacement battery after 4 months, the user-replaceable CR2032 battery Shine uses is a readily available model a lot of digital watches use which is also very cheap to replace. Shine syncs like no other wireless tracker. When the Shine app is open, pressing sync in the app will bring up a circle on the screen prompting you to place Shine within the circle directly on top of your touchscreen. The app will then sense that you've placed it inside the circle and syncing will begin highlighted by cool pulsating wave animation. The only downside to this is that you need to detach Shine from your wristband or whatever accessory you're using each time you want to sync with the app. But if you'd rather not take Shine off of your wrist, you could simply tap the circle on the screen prompting you to physically place the Shine on top. As it turns out, it's only a cool animation effect that makes you think there's some NFC-like connection going on. Because it uses Bluetooth to wirelessly sync with the app, the app itself won't know the difference between your finger or an artificial magnetic touch made by Shine, and syncing will begin regardless. But you do need to ensure you keep a close proximity between the two device when syncing. With nearly an all-aluminum body, Shine's Bluetooth can only escape through the little black plastic marking around its back which is also why Misfit wants you to place it directly on top of your touchscreen when syncing in order to eliminate any Bluetooth connection issues. Because of Shine's syncing limitations, it does not update data in real-time nor can it wirelessly sync in the background like the Fitbit Flex which shows you each step you take whilst you're in the app. So when you wake up first thing in the morning you'll find a single bright LED dot shining at the twelve mark, just irking for you to start moving around so it can fill up Shine's cold, lonely face with brightly lit points of motivation. At least that's the whole plan. You can set your goal using the app in increments of 100, and the app will tell you how fast you'll be able to reach it if you were to walk, run or swim. But that's pretty much it. Setting a goal really doesn't mean anything other than an unknown motivational achievement. These goal points don't really give the user an idea of how much calories you could burn if you reach a set goal which would have been a fantastic way of planning out your goals for the day instead of using a point system which has no definition other than reflecting physical activity. Unlike Fitbit's and Jawbone's Android and iOS app support, Misfit's free Shine app currently only supports iOS devices like the iPhone and iPod touch which is unfortunate yet not surprising. And although you can use your iPad with the app, there isn't an iPad-specific app available. When you triple-tap Shine, it'll switch to a special activity tracking mode which you need to pick and set using the app. This will activate sleep tracking by default, or you can set a different activity which you will be able to activate using Shine after you've synced it with the app. But only a single activity can be tracked and set at a time, so if you've set Shine to track your sleep and the next day you'll be playing tennis, you will need to change the tagging settings using the app which isn't very convenient. Activity tagging is still a beta feature which makes sense considering it isn't very accurate. As it turns out, Shine will automatically turn off a specific tagged activity as soon as it thinks you are done which is often missed. I would much rather be in control of ending a tagged activity I initiated, or at least have the option to turn off Shine's auto mode. And that's just it, Shine's automatic cancellation of your pre-set activity tracking can result in very inaccurate readings that will have you going mad. To be fair, Misfit does seem like it is actively issuing firmware and app updates that slowly improve small issues and even add some new features along the way. And in fact the company has issued both an app and a firmware update during our review. And so it's safe to say that Shine users won't be left in the dark without proper back support from the company - and that we appreciate. As a tracker with no buttons and an on-board user interface, Shine heavily relies on its iOS app to display your data. My experience with using the Shine app has been very positive. The interface is clean, designed well and very simple to use. An orange circle gauge displays your goal points much like Nike's FuelBand app complete with the total number of recorded points. When you tap the inner circle which by default displays your points, more specific information is then displayed like your burned calories, distance traveled and the amount of steps you logged throughout the day. You can also switch from "day" view to "week" view where you'll be able to see the total consolidated data that was logged during the week. Underneath the goal points is a basic timeline graph which displays your physical activity on a scale for reference. Right below the graph is where you'll see colorful tiles of highlighted information like your sleep & deep sleep duration, motivational milestone goals as well as timed activities which notify you of the type activity and how active you were during that time along with the number of points you've accumulated during that time. 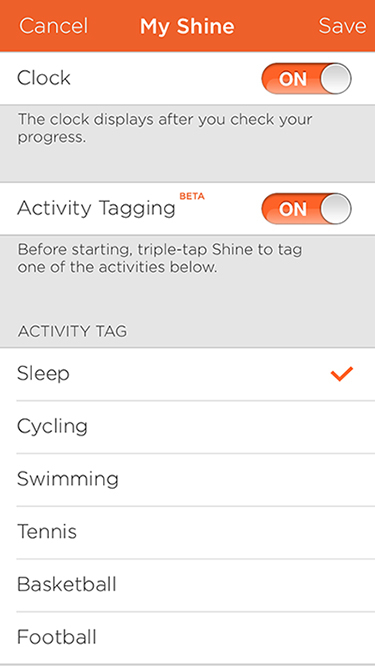 Now the Shine app doesn't categorize certain types of activities which should have been detailed and highlighted when viewing the activity scale, but sadly such activity detail that should help in separating activities like walking from swimming or cycling isn't yet implemented into the app as of this review. Instead, everything will just be blended into one unidentified stream laid across a timeline along with your goal points and other details like distance traveled and burned calories. How accurately Shine performs in counting your steps ultimately comes down to where you wear it. The best place to wear it is on your waist. Otherwise, you could need to pick different places to wear it during other activities which involve anything other than walking or running. 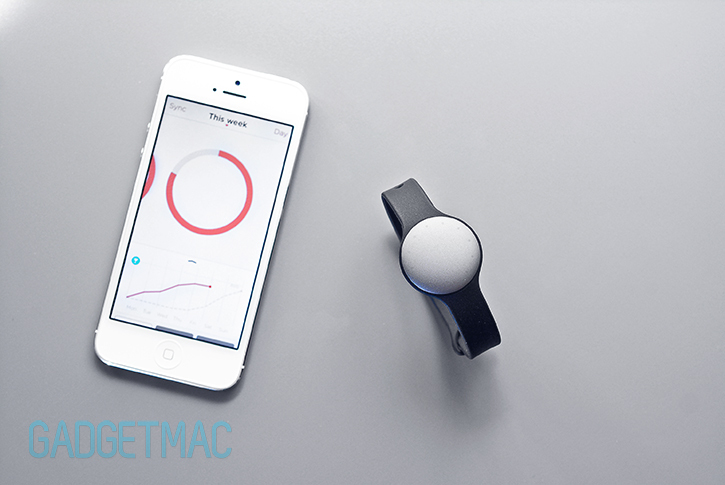 If you wear it on your wrist when you're holding something, no activity will be tracked. Using your height, weight and age to estimate your BMR (Basal Metabolic Rate), Shine does a good job in tracking your steps and distance traveled like a regular pedometer as well as applying its calculations to also tell you how much calories you've burned just as well as the best fitness trackers currently available. The only difference is that you can get better results when tagging different intensive activities which have greater affect on how much calories you burn. The accuracy of Shine's calorie counting is questionable though, and we can't really test how accurate the results actually are. Shine offers users everything a wearable fitness tracker should have in a beautifully designed shell. It's extremely well made, has a very attractive high-end design made to compliment just about any attire whether it be casual, athletic or formal. Although arguably to others it might even look like a glorified power balance band. But is it better than other trackers like the Fitbit Flex? For the most part, yes it is. Shine is without a doubt easier and more comfortable to wear thanks not only to its streamlined low-profile design, but also due to the flexible assortment of adaptable accessories - namely the included Sport Band and Clasp - which also aid in tracking a broader range of physical activities. It's hassle-free and a lot more convenient to use for long periods of time in that it doesn't require charging, but it also combines the best of a wristband and clip-on type trackers into one attractive package. More than a handsome fitness tracker, Shine's jewelry-like design is functional as well. Unlike the Flex and Up trackers, Shine doubles as a mysteriously awesome LED watch which you can take to a whole 'nother level with the optional Leather Band accessory. Shine's halo of white LED lights shining through a seemingly smooth aluminum surface makes reading the time seem like something out of a Star Trek movie and every other futuristic title you can think of. Misfit's Shine really is the single most innovative thing to have happened in the world of fitness tracking gadgets as of late, but it's still not perfect. And In terms of tracking performance, Shine is the tracker you want to go for if you're an active person who enjoys more than just long walks on the beach. Its ability to track physical activities other than walking, jogging and running make it a more rewarding wearable device that knows to count your more intensive efforts to better inform you with relevant data such as your calorie burn - which puts it at a higher advantage point compared to other fitness trackers. Software wise, Shine can benefit from some app enhancements that will ultimately improve the way it function with regards to activity tracking and tagging. We would like to see Misfit add an option that will allow the user to dictate when a certain type of an activity should end, because right now Shine's auto-detection isn't proving to be reliable. And it also doesn't help that Shine only supports iOS devices in order for you to use it as it doesn't have any cloud support or its own desktop app. So while you may be giving up vibrating alarm and stair climbing features, Shine is a great option that is worth considering when looking for a fitness tracker that's probably the most enjoyable one to live with. Updated (1/13/14): We usually don't update our reviews once published, however, Misfit has since improved its Shine firmware and iOS app with a few significant updates as predicted which we think merit a quick second look. This would also be a good time to tell you guys that since our review was published, Misfit has introduced a few new colors to its silver gray Shine tracker lineup including but of course a Champagne gold color, Jet black, as well as a light blue hue the company calls Topaz. There's also even an Apple store exclusive red color too. Now Shine brings a whole new meaning to luxury wearable fitness tracking gadgets with new svelte color finishes that you can proudly present on your body using jewelry-like accessories designed with fashionable style in mind. So in other words, Shine is now even more of a female-type of a fitness tracker more than any other unisex designed tracker out there such as Nike's FuelBand SE. It really doesn’t come as a surprise though. The Shine’s brilliant jewelry design and petit form factor makes it an ideal wearable gadget for women. But then again, grab a black or a silver Shine along with a leather band accessory and you’ve got a totally manly wearable fitness tracker. Misfit's Shine app now supports Android devices with Bluetooth 4.0 and running Android 4.3 or higher. That alone is a worthy upgrade indeed. With the new firmware update, Shine pretty much starts syncing wirelessly once you open up the Shine app without you having to place it on the touchscreen or tap anywhere. And that’s the great thing about Misfit is that it constantly improves its software and pushed both firmware and app updates which are effortlessly updated. You can also turn off automatic background sync through the Shine app if you’d like to save battery. We won't get into much detail, but another significant optional feature the new Shine app brought with it are social features. The app let's you connect with the Shine community as an added boost of motivational fun if you will. You can accept friend requests, see their progress and other Shine users around the world. Speaking of updates, you can now also tell the Shine app where you’d like to wear the tracker so that it’ll know to better track your movements based off of the input you are giving the app instead of guessing using its algorithms. Misift was quick to add this welcome new feature to its app, and we think that’s an excellent way of improving tracking accuracy with such a versatile little wearable tracker. Also, selecting body positions to wear the Shine are done with detailed info graphics that not only show you where you can wear the tracker, but also tell you what those positions are best used to track certain physical activities such as walking, swimming and cycling. You can also suggest other places to wear the Shine using the app in which will help Misfit build better tracking algorithms for even more positions in future update enhancements. The Shine is more accurate in counting your step than the FuelBand SE because of the fact that it simply performs better when it isn’t being worn on the wrist, which is one of its biggest advantages over the FuelBand and other wrist-only trackers. That said, some may find the Shine’s caloric counter to be arguably misleading for the fact that it doesn’t display the specific calories that you’ve burned on a daily basis based solely off of the exercise and activities you’ve performed without also including your statistical BMR - which is information based upon your gender, body weight and height. Many people including myself don’t like the idea of a combined calorie count which supposedly includes your body’s metabolic calorie burn, and prefer to view an estimated measurement based off of a particular physical activity similar to how the FuelBand and Jawbone Up 24 work. However, it would be great if Misfit could issue an update that would show a seperated calorie burn count and one that includes your body's estimated natural BMR burn. Lastly, we noticed that the people at Misfit seemed to have listened to one of our requests to improve the included battery cover opening tool with a more durable one. The old black plastic tool has fortunately been replaced with an improved one that’s made out of metal so that the tip of it will not get damaged as easily as the fragile plastic tool that was once included with all Shine trackers. And speaking of accessory enhancements, Misfit has also changed its clear, dome-shaped hard plastic packaging since we reviewed the Shine when it first came out with a more simplistic, yet effective cardboard packaging.